New bridge over Silver Creek. Hi-Landers 4x4 Club. A popular 4.2 mile Jeep trail from Wright's Lake to Barrett Lake has been reopened. The rugged trail was shut down by court order in 2012 for environmental concerns. The Hi-Landers 4x4 club was instrumental in making changes to the trail to comply with the court order. 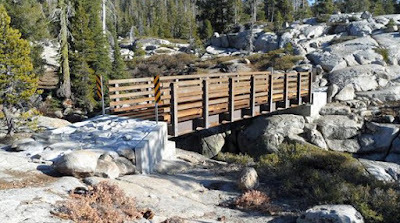 The Silver Creek stream crossing was eliminated by building a 45 foot bridge. Other work included bypassing sensitive meadows and restoring abandoned trail sections. Hi-Landers rates this trail "9 to 10" in difficulty with 10 being the most difficult. The narrow single path trail is for rigs less than 82 inches wide. The rugged trail demands experienced drivers with lifted and modified vehicles. Speeds under 2 mph are the norm. Check with the Eldorado Forest Service (530-647-5415) before you go due to frequent closures for weather. Primitive camping is allowd at Barrett Lake.